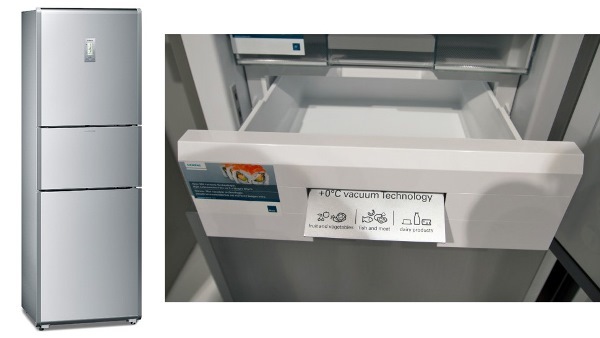 Siemens has brought its new refrigerator with support of so-called “vacuumTechnology” to the exhibition of consumer electronics IFA 2013 in Berlin (Germany). The name of this technology tells that it involves the use of a vacuum to maximize storage life of food. New refrigerator Siemens KG38QAL30 Freshness Center is 1.9 meter high, and has three different compartments for food storage. The upper section is the same as we can see in conventional refrigerators. The mid-section includes a quite standard freezer and an icemaker. The bottom section is called vitaFresh. It is divided into two parts: the top of the container is located with automatic humidity control for fruit and vegetables, and under it there is a box for storing food in a vacuum. Both boxes in the vitaFresh section cool products to almost 0 ° C, while the vacuum box is designed for food that spoils quickly (eg, raw meat and fish). It is hermetically sealed using a special handle. After closing of the vacuum vessel you can activate the pump by pressing an activation button, after which the air is removed from the vessel and its pressure is reduced to 300 millibars. Siemens representatives claim that this system allows food to remain fresh up to five times longer than without the use of vacuum. Due to this technology there is no need for defrosting. Sales will start soon in Germany and the Netherlands. The recommended retail price will be € 1499 ($ 1975). By the end of the year Siemens marketers will evaluate the success of the product and make a decision on whether to move it to other markets. In addition to a new fridge, Siemens also brought a number of household appliances with QR- codes to the IFA 2013 exhibition. These codes are required for special applications of Augmented Reality, which allows owners of devices to quickly get recommendations on various tasks, such as filling the detergent in the dishwasher or replacing the filter in the hood. This will also be an important factor in deciding the kids’ party themes. Use your imagination to come up with some creepy-feeling cuisine. So, starting at the beginning, you need to decide how many kids you want at the gathering.